Public media provider WNET.ORG is playing a major role in the nationwide Lincoln Bicentennial celebration in 2009 with LOOKING FOR LINCOLN, an unprecedented two-hour broadcast, online, and outreach project that explores the life and legacy of the man widely considered one of our best and most enigmatic presidents. The documentary, presented and written by Harvard professor Henry Louis Gates, Jr. (African American Lives, Oprah’s Roots), addresses many of the controversies surrounding Lincoln – race, equality, religion, politics, and depression – by carefully interpreting evidence from those who knew him and those who study him today. It premieres on the eve of Lincoln’s 200th birthday, Wednesday, February, 11, 2009 at 9 p.m. (ET) on PBS (check local listings). In the film, Gates shows how the Lincoln legend grew out of controversy, greed, love, clashing political perspectives, power struggles, and considerable disagreement over how our 16th president should be remembered. His quest to piece together Lincoln’s complex life takes him from Illinois to Gettysburg to Washington, D.C., and face-to-face with people who live with Lincoln every day – relic hunters, re-enactors, and others for whom the study of Lincoln is a passion. Among those weighing in: Pulitzer Prize winners Doris Kearns Goodwin and Tony Kushner; presidents Bill Clinton and George W. Bush; and Lincoln scholars including Harold Holzer, vice chair of the Abraham Lincoln Bicentennial Commission; Harvard University’s president Drew Faust and history professor David Hebert Donald; Yale University history professor David Blight; and Allen Guelzo of Gettysburg College. Former Ebony magazine editor Lerone Bennett challenges Lincoln’s record on race; writer Joshua Shenk talks about Lincoln’s depression; and New Yorker staff writer Adam Gopnik illuminates how Lincoln’s words changed the course of history. 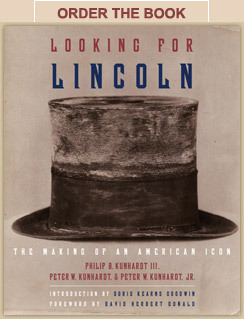 A companion book, Looking for Lincoln: The Making of an American Icon, was written by Philip B. Kunhardt III, Peter W. Kunhardt and Peter W. Kunhardt, Jr. It contains more than 900 images, many from the renowned Meserve-Kunhardt Collection. Booklist recently wrote, “The Kunhardts’ work is sure to be one of the most popular books in the bicentennial effusion of Lincoln volumes.” It was published by Alfred A. Knopf on November 18. Buy Lincoln on Race and Slavery, edited by Henry Louis Gates, Jr. LOOKING FOR LINCOLN is a production of Kunhardt McGee Productions, Inkwell Films and THIRTEEN for WNET.ORG in association with Ark Media. Henry Louis Gates, Jr., William R. Grant, Peter Kunhardt, and Dyllan McGee are executive producers. Senior producer is Barak Goodman. Producers are John Maggio and Muriel Soenens. Sole corporate funding is provided by State Farm®. Major funding is provided by CPB and PBS. Additional funding for education outreach is provided by the Motorola Foundation. For nearly 20 years, Kunhardt McGee Productions (formerly Kunhardt Productions) has been responsible for critically acclaimed historical programming with a reputation for high editorial standards. Most recently, Kunhardt McGee Productions co-produced Oprah’s Roots (2007) and African American Lives 1 and 2 (2006 & 2008) for PBS. Previously, the company produced Freedom: A History of US, an eight-hour PBS series based upon Joy Hakim’s award-winning books. Other notable works from Kunhardt McGee Productions include Lincoln, a four-hour series for ABC; In Memoriam, a one-hour co-production with HBO about Mayor Rudolph Giuliani and the terrorist attacks of September 11, 2001; and The American President, a 10-hour PBS series profiling all forty-one presidents of the United States. Kunhardt McGee Productions is currently producing a multi-part series, Human Nature, for Vulcan Productions and WGBH’s Nova Science Unit to air on PBS in 2010. More information can be found at: www.kunhardtmcgeeproductions.com. Inkwell Films was founded by Henry Louis Gates Jr. to produce sophisticated documentary films about the African-American experience for a broad audience. In addition to Oprah’s Roots, Inkwell Films co-produced African American Lives (2006) and African American Lives 2 (2008), and is currently developing The History of the African American People, an eight-part series tentatively slated for national broadcast premiere in 2009-2010. Ark Media is a documentary film company founded in 1997 by the producing team of Barak Goodman and Rachel Dretzin. Ark’s mission is to produce documentary films characterized by rigorous reporting, careful craft, and imaginative filmmaking. For the last decade, Ark has produced films primarily for the PBS series Frontline and American Experience, and for cable outlets such as The History Channel and American Movie Classics. During this time, our films have won nearly every major broadcast award: the Emmy, DuPont-Columbia, Robert F. Kennedy, Writers Guild and Peabody, as well as earning an Academy Award nomination and official selection to the Sundance Film Festival. For more information, please visit our website at www.ark-media.net. New York public media company WNET.ORG is a pioneering provider of television and web content. The parent of Thirteen, WLIW21 and Creative News Group, WNET.ORG brings such acclaimed broadcast series and websites as Worldfocus, Nature, Great Performances, American Masters, Charlie Rose, Wide Angle, Secrets of the Dead, Religion & Ethics Newsweekly, Visions, Consuelo Mack WealthTrack,Wild Chronicles, Miffy and Friends, and Cyberchase to national and international audiences. Through its wide range of channels and platforms, WNET.ORG serves the entire New York City metro area with unique local productions, broadcasts and innovative educational and cultural projects. In all that it does, WNET.ORG pursues a single, overarching goal – to create media experiences of lasting significance for New York, America and the world. For more information, visit www.wnet.org.